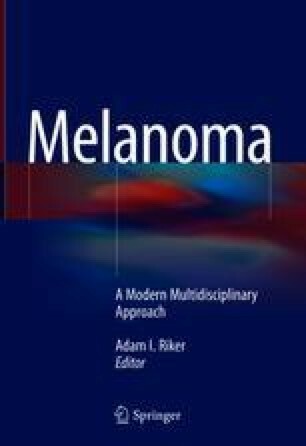 Cutaneous melanoma is increasing in incidence, both in the United States and throughout the world. Risk factors for melanoma are based on host factors, such as freckling, high numbers of nevi, fair skin, and hair and light (non-brown) eyes. These host factors are modified by exposures, particularly ultraviolet radiation from the sun or tanning beds; however, among additional environmental factors, such as polychlorinated biphenyls (PCBs), it is likely that PCBs interact with sun exposure to increase melanoma incidence. Genetic factors are under intensive investigation, both inherited mutations and somatic tumor mutations. Prevention of melanoma is based upon improving the education of society to avoid high levels of ultraviolet radiation. Australia is the leader in developing consistent and widespread programs. Screening for melanoma is recommended for high-risk patients. †Sowmiya Murali and Mary E. Logue contributed equally to this work. Community Preventive Services Task Force. Preventing skin cancer: primary and middle school-based interventions; 2012. https://www.thecommunityguide.org/sites/default/files/assets/Skin-Cancer-Primary-and-Middle-School.pdf. Accessed: 20 Jan 2017. Cancer Council Victoria: History of Sun Smart. http://www.sunsmart.com.au/about/history. Accessed 18 Feb 2017. World Health Organization. Sun Protection and schools: How to make a difference. World Health Organization, 2003. http://www.who.int/uv/publications/en/sunprotschools.pdf. Accessed 20 Jan 2017.